Drift is a general term used to describe the deposits os soil left behind by receding glaciers. Here are descriptions of two types of drift. Loess is a geologic term that refers to deposits of silt (sediment with particles 2-64 microns in diameter) that have been laid down by wind action (aeolian activity to geologists). Extensive, thick loess deposits generally formed in areas bordering large, continental glaciers. Large volumes of meltwater flowed from the edges of these glaciers during the summer. This meltwater carried large amounts of sediments that formed as the glacier ground the bedrock over which it moved. Much of this sediment was silt-sized material known as rockflour. During the winter, when the glacier did not melt, the area where the water flowed was primarily dry. The winter winds would pick up the rockflour from these dry areas and carry it long distances in huge dust storms. When the wind slowed, the silt would fall out and blanket the area. Frequently the resulting loess deposits are several meters thick (tens of feet). Because the source of the silt is the outwash from the glaciers, loess deposits are frequently most extensive and thickest downwind from large river valleys. An examination of a map of the thickness of surface loess deposits in Illinois confirms both of these observations. Often several different loess deposits are stacked on top of each other in an area because each glaciation causes the formation of a distinctive loess deposit. 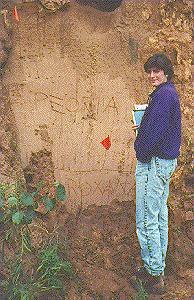 An exposure of two loess deposits in southern Illinois Illinois State Museum scientist Pietra G. Mueller stands in front of a typical loess outcrop. This outcrop contains two of the important Illinois loess units. 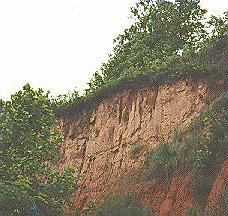 The lower loess is called the Roxana Silt. It was deposited between about 60,000 and 30,000 years ago. It is associated with the next-to-last important glacial advance in Illinois. The upper loess is called the Peoria Silt. It was deposited between 28,000 and 14,000 years ago and is associated with the last major glacial advance in the Midwestern U.S. The orange flag marks the boundary between the two deposits. The midwestern U.S. has numerous examples of multiple loesses deposited in the same place. Approximately thirty percent of North America has one or more loesses deposited over the bedrock. Till is a geologic term that refers to deposits of unsorted and unstratified sediment deposited by a glacier. Much of Illinois and other midwestern U.S. states are covered with tills deposited during Pleistocene glaciations. In fact Lowe and Walker (1984) note that about half of the North American continent is covered with an intermittent blanket of till. In numerous areas tills from younger glaciation overly tills deposited in older glaciations. In Illinois most of the tills are associated with either the last major glaciation, the Wisconsin (maximum about 18,000 years ago) or the next to last major glaciation, the Illinoian (maximum about 180,000 years ago). In Illinois till occurs as both a general blanket that covers parts of the landscape and as large constructional topographic features known as moraines. Moraines are visible as slight rises as you drive across them in central Illinois. The map to the left shows the location of end morains associated with the Late Wisconsin deglaciation in Illinois. These morains represent places where the ice sheet paused as it melted during the last deglaciation. This maps shows the estimated thickness of surface loess deposits (the combined Peoria and Roxana Silts) in Illinois. The map shows thicknesses in five foot intervals for uneroded upland areas. Notice that the loess is thickest just east of the major river valleys, indicating that prevailing winds were from the west.